WIYDB? Dispatches from the Front Lines of Motherhood: DIY - Baking for Autumn, A Two Ingredient Fix? Stylish boots, cozy sweaters and all matter of new treats are arriving at the mall - a common hang out for a mommy needing a fall weather walk. I love to grab a coffee and people watch, taking in more atmosphere than calories wherever possible. I've noticed my fellow caffeine consumers tend to fall in to one of two camps; pumpkin fanatics and pumpkin haters. If you're on the first side of the equation like I am, you are likely thrilled to see the return of Starbucks PSL (pumpkin spice latte, of course) and that tasty Tim Horton's muffin with the nugget of cream cheese and sugar-shock in the middle. If you're trying to fend off some pounds or save some dough (see what I did there?) then home baking might be the ticket. The problem is: baking is science. There are important ingredients to be managed and measured exactly. My mom once made the most delectable pumpkin cinnamon rolls with a gorgeous frosting. I begged her for the recipe, but when I got it, I was shocked. Over 3 hours of mixing, kneading, resting, rolling, slicing, baking, cooling, frosting... It's messy, it's time consuming, and honestly, they didn't turn out! They were more like sticky hockey pucks than the fluffy cinnamon clouds my mom had created! I will first mention, my son was in a "mood" while I tried to bake, so I made this entire recipe (other than the steps involving the oven,) while baby-wearing. Points to the straightforwardness of the recipe for that reason. My kitchen was a little disheveled, but I tried to capture some photos in the interest of science. You're welcome. 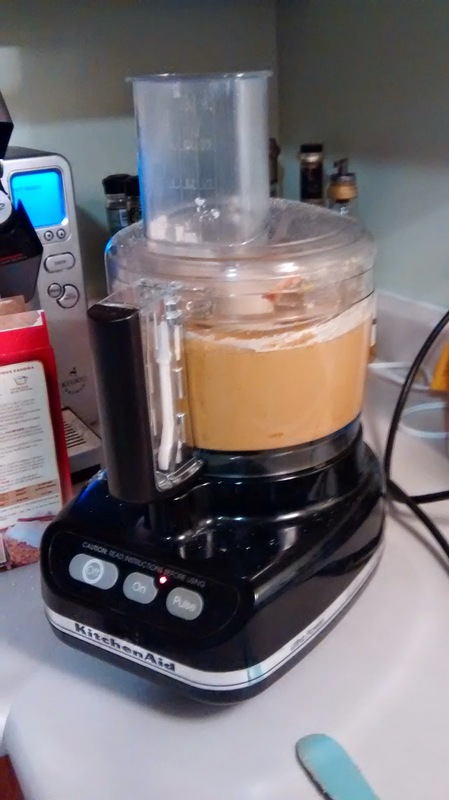 I decided in the interest of simplicity and thorough mixing, to use my amazing food processor to combine the ingredients rather than the good 'ol wooden spoon. This was laziness and not a necessity. It did combine quickly and well, however. 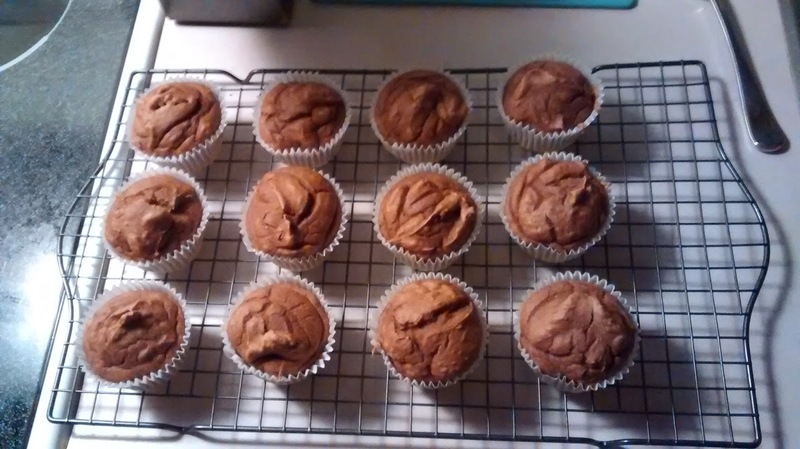 The batter was the consistency of warm peanut butter and it transferred to the muffin tin excellently one handed. Big plus there. I made sure to use muffin liners for presentation value and to avoid possible difficulties in removing the end product from my pan, but I'm sure greasing the tin would have done the same job. For muffins, the instructions suggested 18-21 minutes at 350 C. I baked them 18 and the fork came out clean and dry, so I assumed they were done and left them to rest on my cooling rack. A closer inspection afterwards made me wonder if they could have used a little longer. I live in fear of burning things, especially cakes, which are harder to judge than cookies or savory dishes. They looked beautiful, smelled great and we were eager to try them. The taste is hard to explain. They were "good", but not "great". Possibly in part due to under baking, the consistency had a slight moist, pudding quality. It was definitely cooked through, light and cakey, but the texture was odd. Full marks for flavour, however. A yum factor of 8 out of 10. 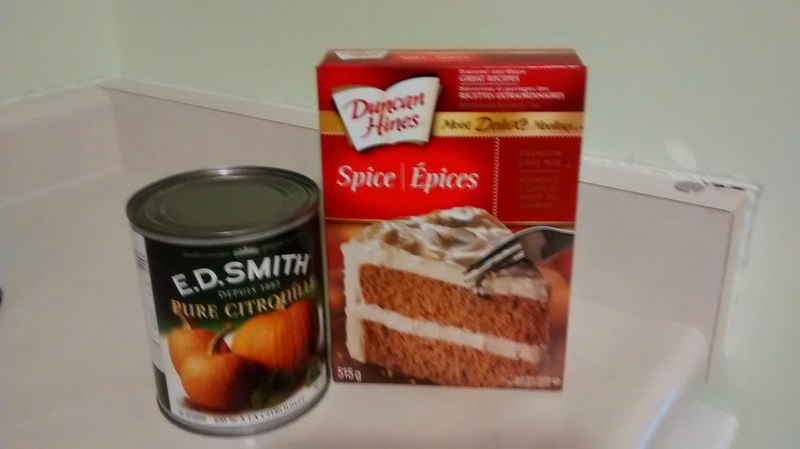 A light spice with a mild pumpkin in the vein of a coffee cake. Really nice. Would I make them again? The best I could say is a solid maybe. I don't buy cake mix often, but if it was on sale or I had an event in mind, I might give it a go. I may have had an allergic reaction to this brand, due to a dye or preservative, so I would look for another kind. I would bake the muffins slightly longer, or perhaps add one egg for some stability. I would absolutely add another textural element, like walnuts on top to give it more personality.